What happened to seasonal colors? Orly's up there with Sinful Colors and OPI breaking away from the usual fall earth tones and smokey shades. Their new In The Mix collection has five bold creams and a glitter topper that looks like confetti. When I first saw promo shots for it, I wrinkled my nose a little. Then I saw it at the nail supply shop and felt oddly drawn to that frenzied glitter. Sometimes I think I buy stuff as a kind of dare to myself. Whatever my motivation was, I passed on the creams and went with just the glitter. 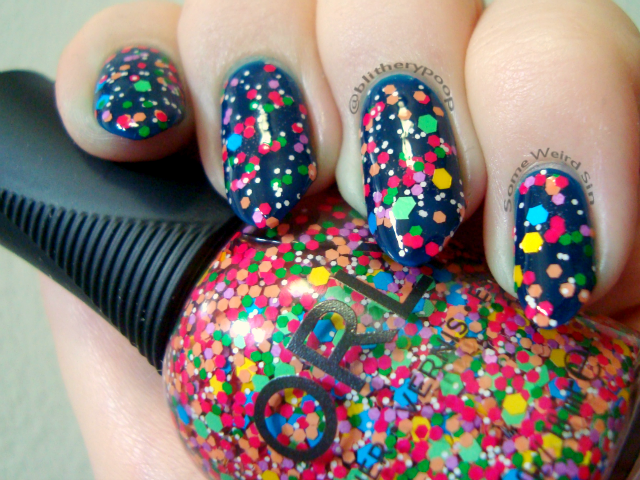 Turn It Up has chunky multicolored and white matte glitter in a clear base. It's kinda...retro nifty, isn't it? All of the colored glitters except for the yellow are slightly desaturated in a way that reminds me of vintage fabrics and housewares. My grandmother had a bunch of metal trays with a similar color scheme. Orly's got a so-so history with glitter. Some of their '12 or '13 glitters sunk harder than the Titanic. They seem to have fixed their glitter base since then. Believe it or not, this is my first chunky glitter from Orly. The application is just ok. The glitter goes on fairly easily, but clumps together. You can see that in a few spots, especially near the middle of my ring finger. I wound up letting them huddle, then dabbing more on to even things out. This made the base bubble. You can see that a bit on my my pinkie. They're tiny so it's not a deal breaker. What might kill Turn It Up for some people is that it wants ALL of the topcoat you can throw at it. It took a bunch of coats to smooth it out. Nothing new for anyone who's used to glitter toppers. And it's cute, so what the hell, right? Bottom line: Turn It Up is way better looking on the nail than in the bottle. It takes dabbing to get an even application, the base bubbles when you dab, and it's thirsty....but it's got a retro charm to it that really surprised me. Do you ever get impulsive and buy polish you're not sure you'll like? What was the last polish that took you by surprise?